Last Tuesday, Shawn and I became aunt & uncle to our first ever nephew, Avery Vladimir Lau. (What a big name for such a small human!) Not only is it our first nephew, but it's his mom's first grandchild too... so I guess it's a pretty big deal! His brother lives a few hours away from us, so we probably won't meet the little dude until Thanksgiving, but to be perfectly frank, I am a-ok with that. Newborns are weird! They look like little aliens and, as my friend Amy so eloquently put it, "all they do is sleep, eat, piss, and poop". (To which I responded, "well, that's all we really do in essence too, we just added all the other stuff in for shits and giggles." I mean, really. Think about it.) I am not what you would call a baby person. Luckily for me, neither is Shawn! 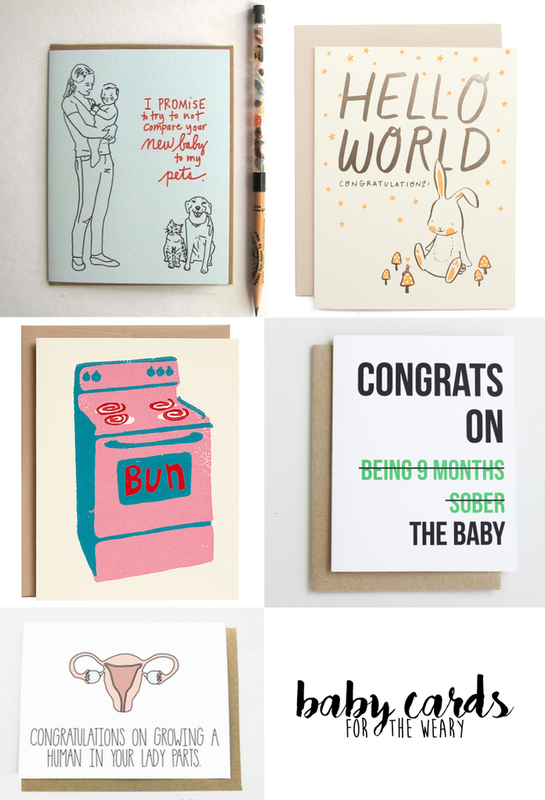 Anyways, all of that to say that I rounded up a few congratulatory little-human cards for you, in case you know anyone who is expecting. You can really go in all kinds of directions with baby cards, depending on what your stance is on kids. I bought this one in a pinch, but I'm kinda upset because there are so many other fun ones out there! Another one I contemplated just had text across the front that read "Congratulations on your little tax deduction." Yep. Tell them how you really feel!